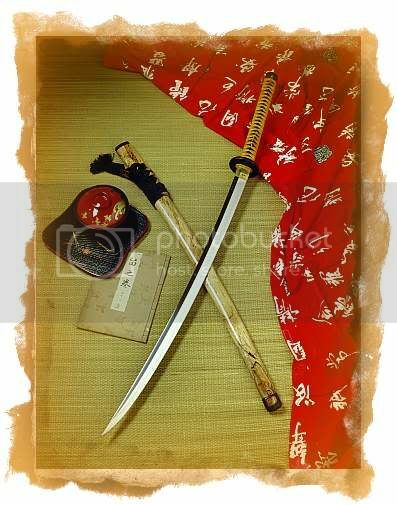 I haven't had the chance to use it yet, my next Battodo session will be around the end of January. About the Shobu I find it to be a very massive and impressive sword, the o-kissaki is really gorgeous. It can clearly be put in the "heavy weapon" category. Last edited by Chewie on Thu Dec 23, 2004 6:37 am, edited 1 time in total. Very nice sword there, glad that you are happy. Maybe later you'll post pics from tameshigiri . maciek1230 wrote: Welcome to the forum. And Chewie...! great to see you again! so glad you got it and posted the pics, man. And yes, some tameshigiri pics must be posted by February! i was gonna get this sword, i still might actally get one. HatchA -> The final cost, including shipping and customs, was around 1000€. Congratulations Chewie, excellent choice, and with a lovely sugata. I have always wanted a Bugei Shobu, however it's always been a bit out of my range, maybe in the future! Btw didn't you always get the impression that the willow-leaf blade (translation for Shobu Zukuri) has always looked like [blank]? Then again I suppose variations on the same theme were never uncommon. Anyway Congrats! you surely have a superb blade! Edit: No linking to other sites selling swords please. So if I saved the photo would it make any difference? after all it only showed the photo anyway apologies for any inconvenience.